As one of the oldest systems of medicine, Ayurveda sees the body as a microcosm of the larger macrocosm, essentially our bodies are a reflection of what’s happening outside. Staying healthy means living in harmony with nature and the seasons. Each season raises a specific dosha (sometimes two). With summer being hot, pitta increases. To counteract the heat, your diet should be predominantly cooling, bitter, astringent, and sweet. Fall is hot with residual summer heat and also dry; you see leaves change and plants wither in the dryness. Pitta, and then vata increase as a result. Winter is by far my favorite season of eating with a diet that includes heavy, sweet, oily, sour, and salty foods to counteract the cold and wind. But the same sun that causes the winter snow to melt and spring flowers to blossom, causes kapha–heavy, earthy elements–outside as well as inside our bodies to liquify as well. Unfortunately, allergies and colds can come as a result of the excess kapha dosha, too. Light recipes don’t have to be nasty or tasteless. 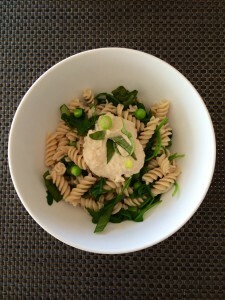 Here’s a spring recipe that will take less than 20 minutes to prepare featuring barley pasta, cashews, peas, and garlic. Barley is the perfect grain for spring as it reduces water and heaviness in the body. If you replace wheat with barley during this season, you’ll feel lighter and lose weight, too. Using cashews in place of cheese keeps this recipe lighter (though cashews are still heavy, so use this “cream” sparingly). Toast pasta for a minute or two to lighten it. Then boil water and add the pasta. Cook according to package instructions. As the pasta cooks, sauté the garlic in ghee for a minute, add the greens and 1/4 cup of water, cover and sauté another few minutes so the greens can wilt. (You can add a splash of white wine if you have it.) Then add the peas and cook another few minutes and add more water if the pan gets dry. Blend cashews with 1/2 cup water, rice vinegar, lemon, salt, pepper, and one clove of garlic. Add more water to create more creaminess. The cashew cream is sweet and heavy, but less congesting than cow’s milk cheese. Just use a dollop on top of the pasta. Once the pasta is done, drain and mix in with the veggies. Add salt and pepper to taste. Serve with a sprinkle of basil and a dollop of cashew cream.